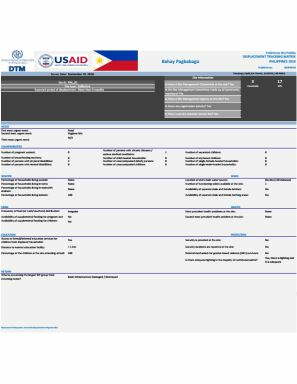 The following document is a compilation of site profiles produced following the assessment of main needs and vulnerabilities after Typhoon Mangkhut (locally know as Typhoon Ompong) hit the Philippines. 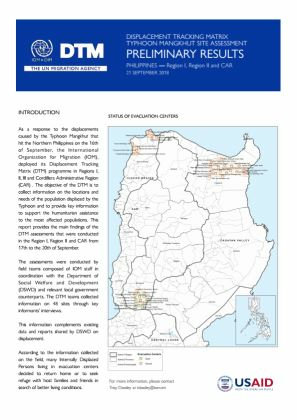 The following document is a compilation of site profiles produced following the assessment of main needs and vulnerabilities in Region III after Typhoon Mangkhut (locally know as Typhoon Ompong) hit the Philippines. 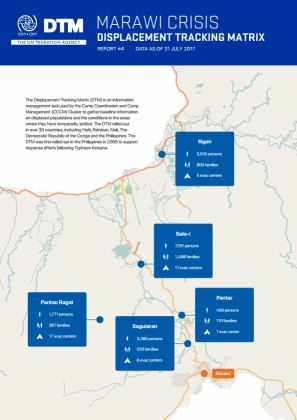 In Cagayan province (Region II - Cagayan Valley), all 19 sites assessed by IOM were closed. 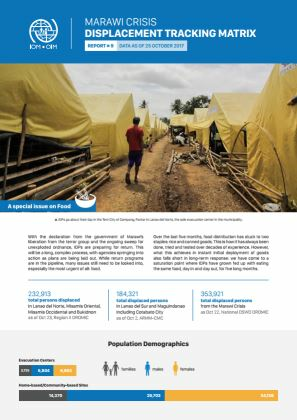 The data in this report focuses on the alternative dwelling spaces and other provisions geared towards improving the living condition of IDPs, the IDPs who have returned and the issues relevant to the return program, and population demographics. 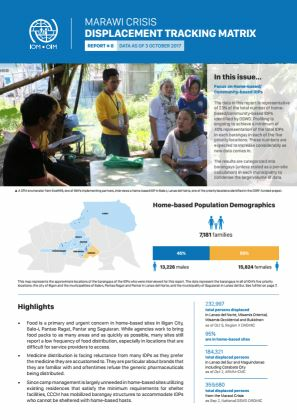 The return process is seeing an influx of IDPs flowing back in to their barangays when the government opened up the first cluster of nine barangays last October 29. 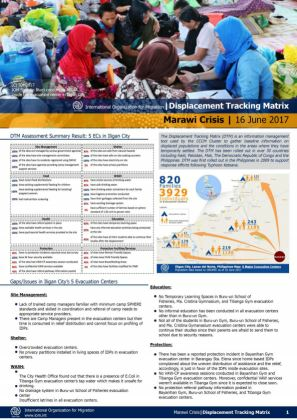 The declaration of Marawi’s liberation from armed groups that took control of the city, has opened it back to residents. 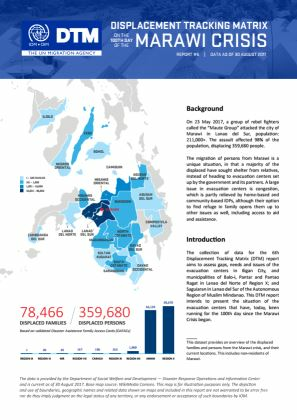 Beginning last 29 October 2017, residents from periphery barangays have begun to return, starting with nine barangays cleared by the military for unexploded ordnance. 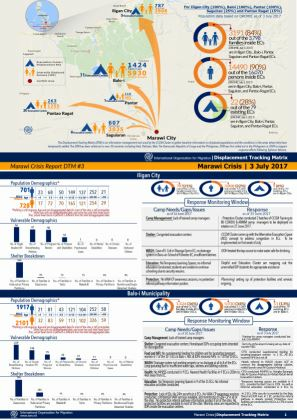 On 23 May 2017, a group of rebel fighters called the “Maute Group” attacked the city of Marawi in Lanao del Sur, population: 211,000+. 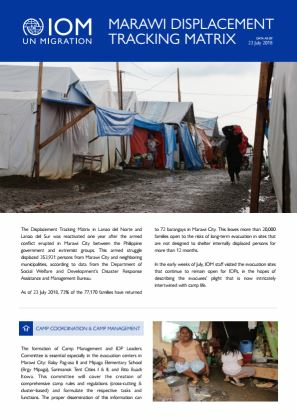 The assault has displaced hundreds of people. 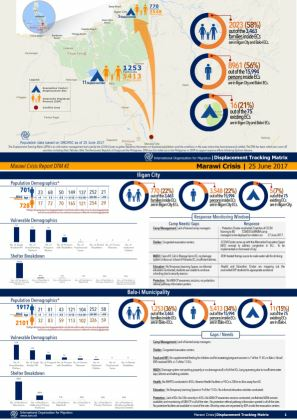 On 23 May 2017, a group of rebel fighters called the “Maute Group” attacked the city of Marawi in Lanao del Sur, population: 211,000+. 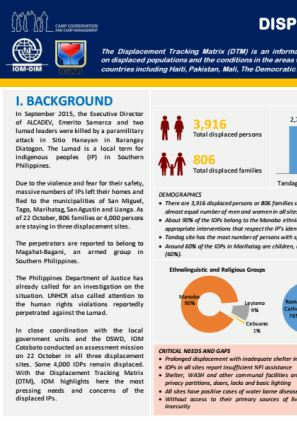 The assault affected 98% of the population, displacing 359,680 people. 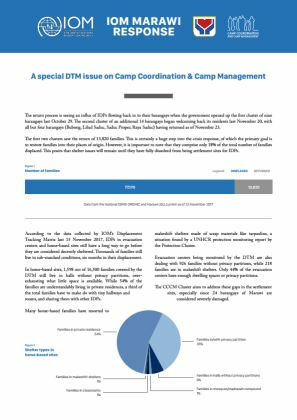 The Displacement Tracking Matrix (DTM) is an information management tool used by the Camp Coordination and Camp Management (CCCM) Cluster to gather baseline information on displaced populations and the conditions in the areas where they have temporarily settled. 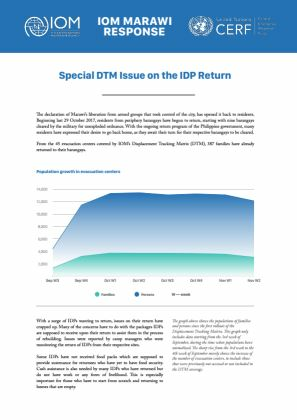 During the reporting period DTM identified 3,798 displaced families (16,070 individuals). 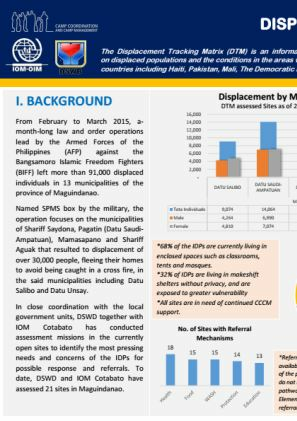 During the reporting period DTM identified 3,463 displaced families (15,994 individuals). 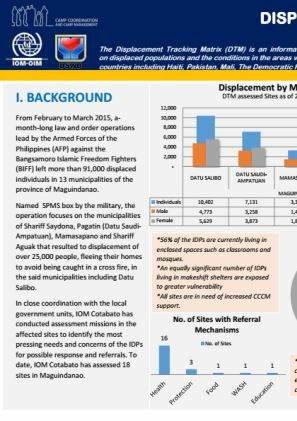 During the reporting period DTM identified 820 displaced families (3,929 individuals). 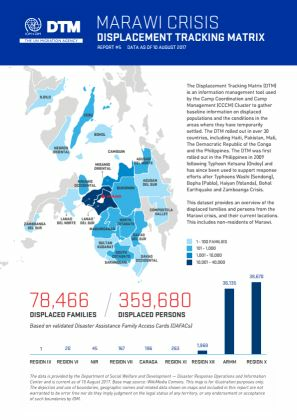 5 evacuation centers were surveyed and issues in the following areas were observed: site management, shelter, WASH, education and protection. 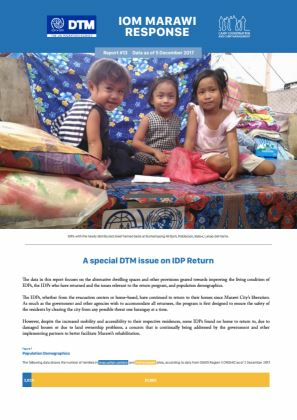 Children comprise more than half of all the recorded internally displaced persons (IDPs). 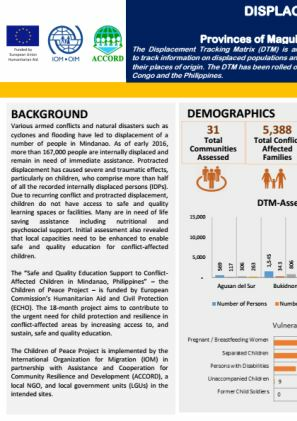 DTM assessed 31 communities and recorded a total of 5,388 conflict affected families (28,559 individuals). 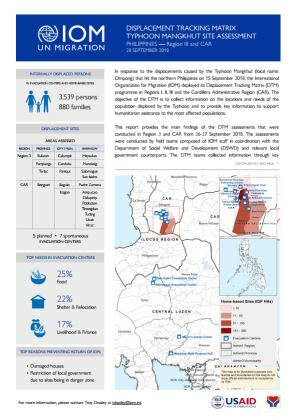 In close coordination with the local government units and the DSWD, IOM Cotabato conducted an assessment mission on 17 September in Tandag City Sports Center where 2,886 IDPs remain displaced. 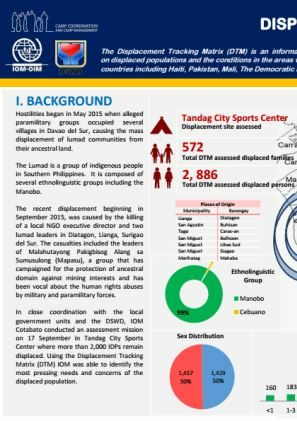 About 90% of the IDPs belong to the Manobo ethnic group. 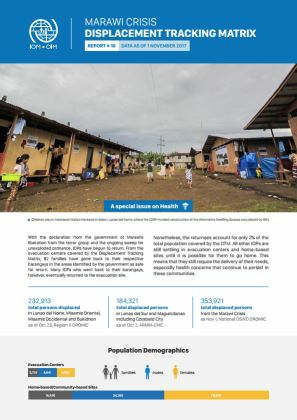 This necessitates culturally appropriate interventions that respect the IP’s identity and culture. 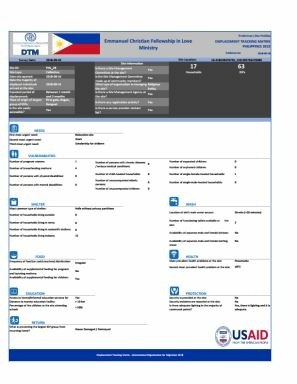 Tandag site has the most number of persons with special vulnerabilities. 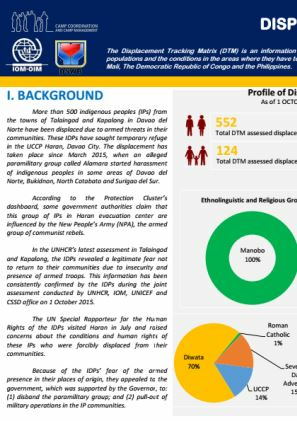 In the UNHCR’s latest assessment in Talaingod and Kapalong, the IDPs revealed a legitimate fear not to return to their communities due to insecurity and presence of armed troops. 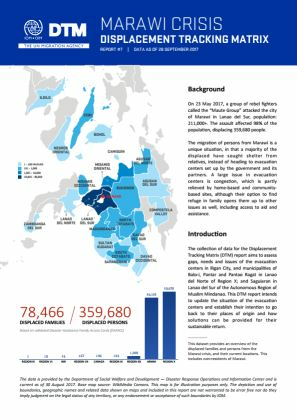 From February to March 2015, a-month-long law and order operations lead by the Armed Forces of the Philippines (AFP) against the Bangsamoro Islamic Freedom Fighters (BIFF) left more than 91,000 displaced individuals in 13 municipalities of the province of Maguindanao.